1. Organized Intra-university Debate Competition in 2009. 2. Organized Intra-university Presentation Competition in 2009. 3. Coordinated Intra-university Code-Knack event in 2009. 4. Organized Intra-university Declamation Competition in 2009. 5. Chief Organizer & Comparer of Fresher’s Party 2010. 6. Organized Intra-university Poetry Recitation Competition in 2010. 7. Comparer (Host) at the Eternal University Foundation Day programmee in 2010. 8. Organized State-level Microsoft Dream Spark Yatra at Eternal University in March 2011. 9. Organized Eternal Football League-2011 in September 2011. 10. Organized Intra-university Tech. Fest. VIHAAN’11 in December 2011. 11. Coordinated Industrial Visit to South India in January 2013. 12. Organized Teachers Day-2013 at HPUBS Shimla in September 2013. 13. Organized Alumni Meet-2014 at New Delhi in March 2014. 14. Organized AARABDHI'14 (National-level management fest) in May 2014. 1. Served as the HOUSE CAPTAIN of Nilgiri House in Kendriya Vidyalaya, Shimla for the session 2006-07. 2. Served as the HEAD BOY (School Captain) of Kendriya Vidyalaya, Shimla for the session 2007-2008. 4. Served as the University Mess Coordinator (Boys) for 2 consecutive terms 2008-10. 5. Presently serving as the coordinator of Eternal Technocrats Club (Technical Management Club), Eternal Literary Society and Eternal Cultural Club at Eternal University, Baru Sahib. 7. Represented North India in 3-day “National Placement Conference-2011” at Goa, organized by Freshersworld.com (India’s #1 Job portal) in February 2011. 9. Selected as the Campus Ambassador for Eternal University by FirstNaukri.com (A job portal providing job opportunities to Freshers). 10. Team Manager of ECE Team (winning Team) in Eternal Football League-2011. 11. Chief Coordinator for Literary Events and Core Organizing Committee member for VIHAAN’11. 12. Elected to be the Departmental Representative at HP University Business School, Shimla in HPU SCA Elections held in August 2013 with 75% votes in favour. 13. Training & Placement Coordinator at HP University Business School, Shimla. 14. Elected Vice-President of HPUBS Students Association for the session 2013-14. 15. Fest Convener for AARABDHI'14. 1. Stood National Topper in Hindi (97 out of 100) in Matriculation Examination conducted by I.C.S.E. in 2006. 2. Secured 2nd Rank in Talent Search Examination-2007 conducted by Sahil Study Circle, Chandigarh. 3. Secured 2nd (second) position in Non-medical stream in Kendriya Vidyalaya, Jakhoo, Shimla in All India Senior School Certificate Examination conducted by C.B.S.E. in 2008. 4. Secured 3rd (third) Position in Computer Science Engineering Department in 2nd Semester (session 2009-10) in Eternal University, Baru Sahib. 5. Secured a position in top 10 students of Eternal University, Baru Sahib scoring 9.3 C.G.P.A in 6th Semester. 6. Secured 2nd position in Entire HP University in MBA 2nd semester examinations held in June 2013. 7. Secured 3rd position in Entire HP University in MBA 4th semester examinations held in June 2014. 1. Won a certificate & cash prize in State-Level poetry recitation competition in 2004. 2. Won 2 bronze medals in 4x100m & 4x400m relay in Intra-School Athletic meet in 2004. 3. Won 2 silver medals in 4x100m & 4x400m relay in Intra-School Athletic meet in 2005. 4. Awarded with “GOOD CONDUCT” award in St. Edward’s School, Shimla in 2005. 5. Awarded 1st (first) prize in North Zone and 4th (fourth) prize at National-level in 19th National Youth Parliament competition-2006, conducted by The Ministry of Parliamentary Affairs, Govt. of India, New Delhi. 6. Won 1st prize in Intra-school Story competition held on the occasion of Hindi Pakhwara in 2007. 7. Won 2nd prize in Intra-school English to Hindi translation competition held on the occasion of Hindi Pakhwara in 2007. 8. Won 3rd prize in Intra-school Essay writing competition held on the occasion of Hindi Pakhwara in 2007. 9. Won 3 prizes, 1st prize in Best Manager, 1st prize in Me against Myself & 2nd prize in Press Conference in National level Technical Festival “EMANATION-09” held at CASE group of Institutes, Baddi in 2009. 10. Won 3rd Prize in Best Manager in National Level Technical Festival “EMANATION-10” held at BUEST, Baddi in 2010. 11. Won 1st Prize in Inter-college Declamation Competition-2009, at Eternal University, Baru Sahib. 12. Awarded with “Exceptional Organizational Skills 2009-10” award for excellence in organizing events at Eternal University, Baru Sahib. 13. Awarded with “Technocrat of the Year - 2009” award at Eternal University, Baru Sahib. 14. Awarded with “Eternal Campus Ambassador - 2010” award at Eternal University, Baru Sahib. 15. Won 3rd Prize in Inter-College Poetry Recitation Competition-2010 at Eternal University, Baru Sahib. 16. Won 2nd Prize (Rs. 3,000 cash) in G.K. Quiz in National Level Technical Festival “NIMBUS-2011” held at NIT Hamirpur in 2011. 17. Won 2nd Prize in Group Discussion at ILLUMYNATION-2011 (Tech Fest at LRIET, Solan). 18. Won 3rd Prize in Inter-College Jeopardy Competition in September 2011. 19. 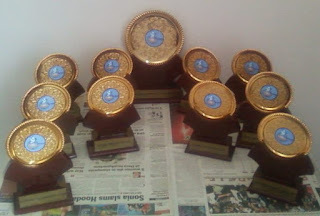 Won 7 prizes in various events in Intra-University Tech Fest. VIHAAN’11 in December 2011. 20. Won 1st prize in article writing and 2nd prize in poem writing competition at National Level Tech Fest ALGORYTM'12 held at Chitkara University, Baddi in March 2012. 21. Won 2nd prize in Debate competition at National Level Tech fest UTKARSH'12 held at UIIT, HP University, Shimla in September 2012. 22. Won Special prize in Declamation Competition at GEN-NEXT TIMES inauguration at Gaiety Theatre, Shimla on 31st March 2013. 23. Won 5 prizes in different categories at HIMSPARK'13 (Management Fest held at Central University of HP) on 4th-5th April 2013. 24. Won 3 prizes in different categories at HIMSPARK'14 (Management Fest held at Central University of HP) on 13th-14th May 2014. 1. Have voluntarily donated Blood 6 times in the past 4 years in Voluntary Blood Donation Camps. 2. Founder member of RC Group: A group of like-minded students at HPU Shimla who aim to bring about a change in the society. 3. Volunteer Writer with HIMACHAL WATCHER (A non-profit Online Portal which raises public issues with Govt. of HP). 1. Mini research case study on the topic “U.S. Recession 2008” submitted to HOD, Department of Electronics and Communication Engineering, Eternal University, Baru Sahib. 2. Prepared “Eternal Water Purifier”, a water purification device for BPL families under Akal Institute of Renewable Energy, Baru Sahib. 3. “Metro Train” project based on PIC Micro-controller with Embedded C as coding language. 4. Published a paper titled “Run your Car on Water” in the International Conference on Recent Advanced in Electronics & Computer Engineering held at Eternal University, Baru Sahib on 17th-18th December 2011. 5. Published a paper titled “Water Purification using solar energy” in the International Conference on Renewable Energy held at Eternal University, Baru Sahib on 5th-6th March 2012. Lot More to Come........................ Just 29 Years of My Life completed.